Bruce seemed particularly focused at the start of the show, saying very little to the crowd as he ran through the first eight songs. 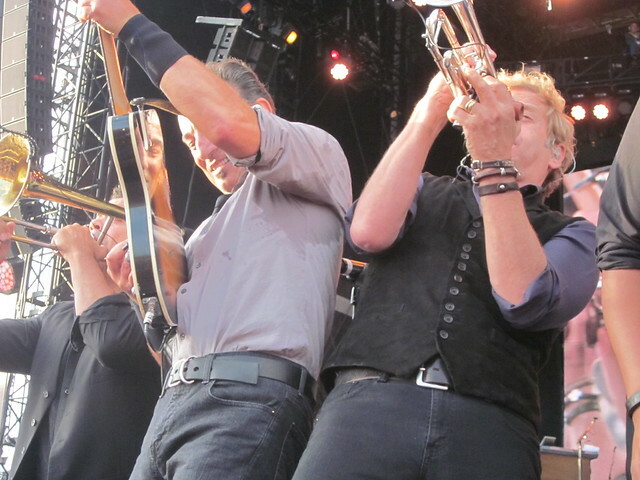 It would be very interesting to see the planned setlist as Bruce was calling off each of the songs to the band. They may not have all been audibles per se, but perhaps were the planned songs shifted around in order. “My Love Will Not Let You Down” into “Badlands” worked extremely well and provided an early demonstration to Bruce that he had a great crowd down front for the finale. We Take Care of Our Own was restored to its rightful place at the beginning of the show as Bruce brought things full circle by bringing back this key new song at the end of the tour. “Adam Raised a Cain” signaled that tonight wouldn’t be a “Darkness show,” and also that Bruce wasn’t planning on leaving anything behind on stage, as he turned in a couple of ferocious solos, and even started adding extra guitar licks between lines near the end of the song. “American Skin (41 Shots)” was as powerful now as it was when it debuted this tour in Tampa, with Bruce’s solo only overshadowed by the song’s coda, with Nils soloing on guitar, Jake on saxophone, Bruce singing the “you can get killed just for living in” line, and the crowd singing the “41 shots” refrain. When Bruce started “The River,” he mumbled something about “having debts to pay with the next four songs” and it wasn’t quite clear what he was referring to at the time, as Bruce made a dedication before song, but with no additional explication. But then, when he came down to the front platform to retrieve the “Wild Billy’s Circus Story” sign, it was understood that he chose the final show of the tour to reward his regulars with the songs that they had been requesting all tour. The Wild Billy sign had been to twenty-seven different cities, and Bruce had great fun reading them all. He remembered that he had taken the sign several times before without playing it, and somehow the sign kept coming back. 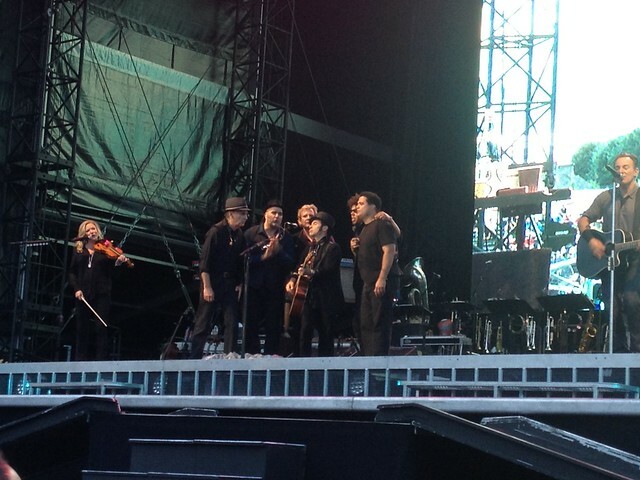 Clark played the tuba part, Roy on accordion, Steve on mandolin, and Bruce and Nils on acoustic guitars. Everett even had the crash cymbal part covered after “the 95…96…97!” lyric. 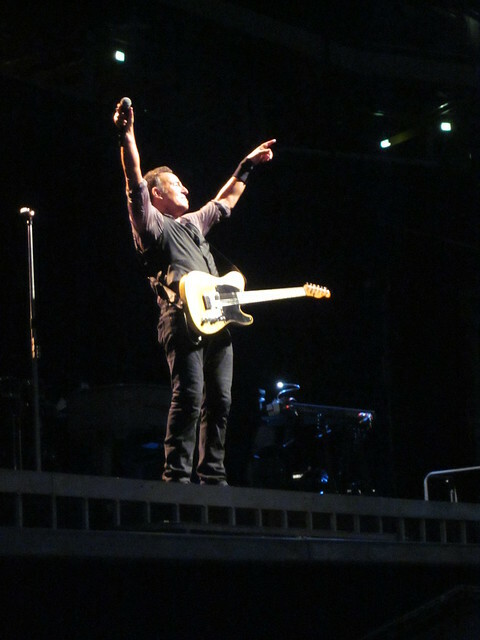 The theme continued with Bruce retrieving a “Man at the Top” sign, this time noting all the tape holding the sign together as a reference point for all the shows it had been to. The arrangement on this song was nothing short of brilliant, with Bruce finding new ways to use the band. The singers – Curtis, Cindy, Michelle and Everett – lined up stage left but then Bruce also had the entire horn section gathered around Nils stage right to add vocals as well. 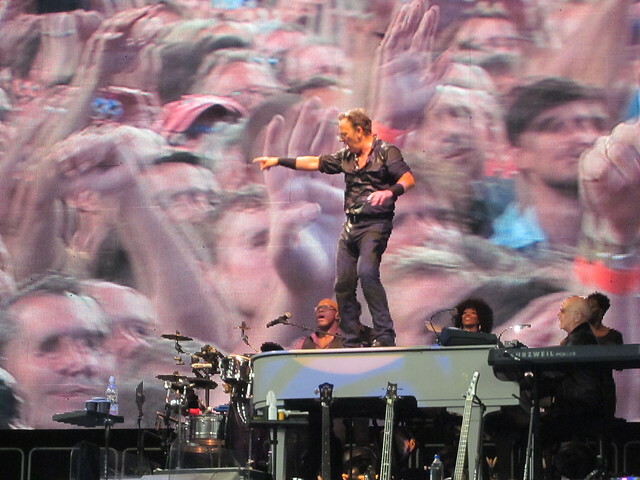 The third tour premiere was “When You Walk in the Room,” with Bruce playing the twelve-string electric guitar and Charlie shining on the keyboard part. The three premieres were the only “requests” granted all night, and each were obviously well rehearsed and planned; Bruce really was “all paid up” at this point. 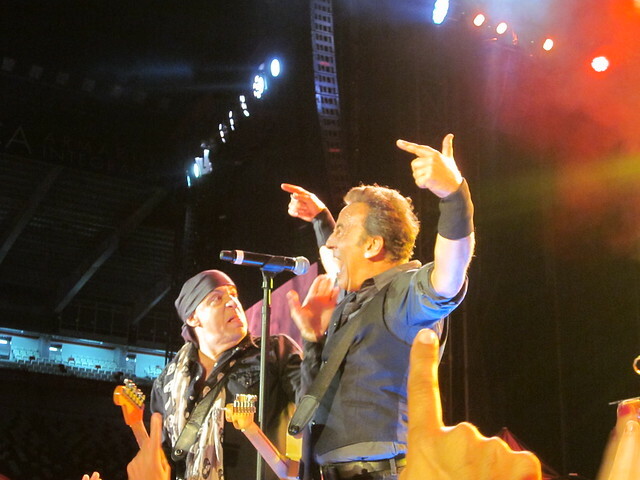 The Born to Run album performance was dedicated to Jimmy Iovine, in attendance at the show, with Bruce recalling a “skinny Italian kid” at the recording studio and being unsure if Iovine “really knew what he was doing.” My preference was that Bruce would have avoided a full-album performance at the last show, but it was good to see the full-band version of “Thunder Road” make one final appearance on tour, and with “Tenth Avenue” and “Born to Run” going to make the setlist regardless of the album choice, there wasn’t too much unnecessary redundancy from recent shows. It should also be noted that band’s playing on the album segment was excellent, including, particularly on “Backstreets” and “Meeting Across the River.” And yes, during “Jungleland,” a soft summer rain did indeed start falling, ending shortly after the song ended. Earlier in the tour, I had heard a third-hand report that Bruce was not a particular fan of “Ain’t Good Enough For You,” as possible explanation as to why it was played so infrequently, despite being requested so often. Tonight could be some corroboration of that theory, because if there was ever a show to play the song, it would presumably be the show where Mr. Iovine is actually in the house. It has been stated here multiple times that “Ain’t Good Enough For You” would be a worthy alternate for “Waitin’ on a Sunny Day” in the Wrecking Ball tour shows. It never happened, but at least for this final show, Bruce actually dropped “Sunny Day” from the set. In some ways, this was perhaps the biggest surprise of the night. At the start of the encore, Bruce took the unusual step of gathering the entire band in a huddle at the center of the stage, which I suppose let to expectations of something out of the ordinary, rather than several of the hits from Born in the U.S.A. Tonight, “Dancing in the Dark” was particularly notable, as Bruce brought all of the horns and singers down to the front of the stage. 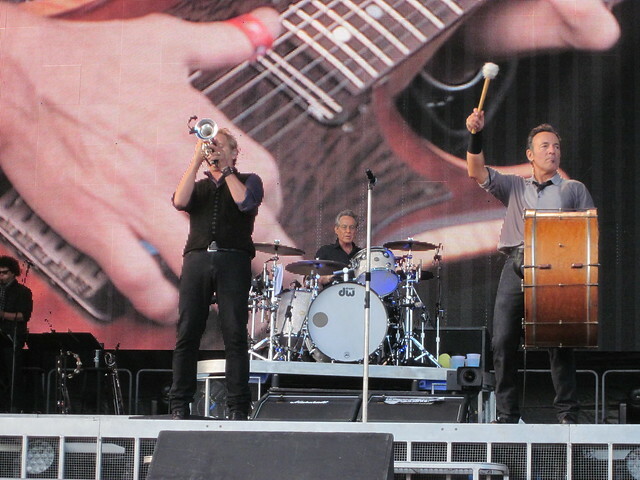 The horn players were already there, having come up for “Seven Nights to Rock,” and Bruce stopped them from returning to the riser at the back of the stage after “Dancing” started. Up at the front, along with the singers, they got to show off their self-choreographed dance moves for the entire crowd one last time. Watching the two sections at the back of the stage is always great fun, and I found it quite meaningful that Bruce wanted to show off that fun aspect of his band one last time as well. “After a and a half, and 130 shows….you know you make me wanna Shout!” was the introduction to the Isley Brothers number that has worked so well as a finale song this tour. Bruce started his usual introduction of the band – “earth shocking, booty-quaking, history-making” which was itself quite amusing, as so many of the fans can now do the same introduction along with Bruce simply by memory. 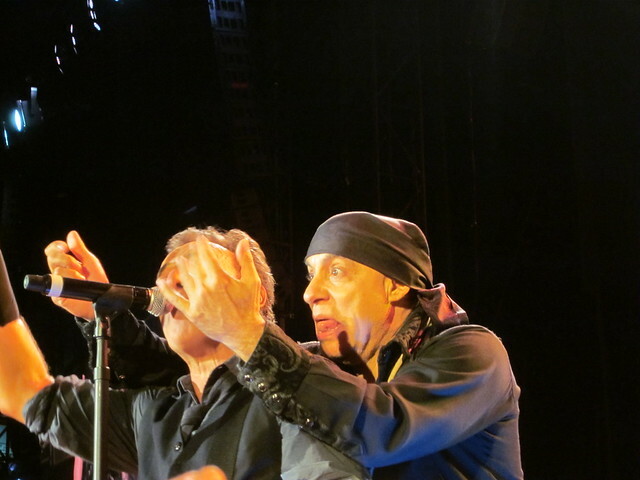 Yet after finishing, Bruce continued – we want to salute, the “ticket-seeking, hotel-booking, money-juggling, plane-taking, train-riding, queue-forming, tramp-meeting, feet-throbbing, back-breaking, burger-eating, rain-enduring, music-loving, Boss-following…E Street Fans!, as all of the band members went up to the microphones to shout the last line. The list Bruce read was from one of the truly great fan-made t-shirts and it was quite touching that he chose to incorporate it with the band introduction. Bruce retrieved an acoustic guitar from Kevin to start “This Little Light of Mine” but either in the guitar transfer or the start of his strumming, he appeared to tear a fingernail, which he then finished ripping off with his teeth and kept going, despite the blood now dripping from his finger. Given how the Wrecking Ball tour has progressed, it was certainly very surprising to see the Born in the U.S.A. album get played again. I would hardly presume to compare an arena show such as Leeds – or even a small stadium show such as Cardiff – to a Kilkenny stadium show. Comparing Limerick, Cork or Belfast certainly seems fair, however, and tonight’s setlist compares quite unfavorably to any of those shows. As stated here before, setting aside any general dislike of the gimmick that is full-album shows, there’s not anything specifically wrong with Born in the U.S.A.; from top to bottom, it’s certainly one of Bruce’s most consistent records, and if no doubt serves as the crowd-pleaser. What remains frustrating about the shows where this album is featured is that Bruce takes such a strange approach to the setlist surrounding it. It’s as if he goes on auto-pilot and can’t realize that when playing the album full of hits, he can and should use the balance of the set for more challenging material. Of course “Badlands” and “Out in the Street” is a great way to open a show. But if the set is already guaranteed to contain a run of hits in the middle, it would be appropriate to try something less familiar at the top of the show, when Bruce has the audience’s attention simply because it’s the very beginning of the show and everyone’s excited. The covers granted by sign request were great fun. Yes, the performance might have been a little sloppy, but it hardly detracted from them. They’re both personal favorites and I was thrilled that Bruce played “Shake” and “Sweet Soul Music.” Looking at them objectively, though, it is obvious that they were misplaced in the show. Those songs are exactly the sort of thing that should be saved for the encore, particularly when the Born in the U.S.A. hit singles are being played in the main set. There was no reason Bruce couldn’t simply have taken the signs and deferred playing them until the encore; he’s certainly done that numerous times before. if anything, tonight’s show simply sets hopes higher for Sunday. It would be a fair expectation that Bruce keeps the repeated songs to the absolute minimum (Wrecking Ball songs, “Born to Run,” “Tenth Avenue,” “Badlands,” and “Dancing in the Dark”) and sends the tour off with a worthy finale. Reports on the show can be found at Backstreets and Brucespringsteen.net. Playing “Born in the USA” for a festival crowd is a logical move, and Bruce was clearly focusing on his three British shows as a set, as he had done “Darkness” in Wembley and “Born to Run” in Coventry. The lack of imagination necessary to choose to full album performances is well-documented here and need not be repeated. These issues notwithstanding, playing “Born in the USA” on consecutive nights was not an error on Bruce’s part, and while my personal preference is for something different, it seemed clear that a majority of his paying customers were happy with the choice. The issue with London’s show was that the actual performance of the material was severely lacking. Paris may have been a completely unadventurous setlist but there was little complaint as to how well those songs were played. London, conversely, did have a few different choices for the set surrounding the album but the performance as a whole was simply not up to the standard that is reasonably expected from an E Street Band show. “Reason to Believe,” for example, was a more challenging choice for a festival audience, but never got the chance to work as Bruce and the band were out of sync for the entire song. If Bruce is going to leave his setlist variety to the whims of the signs he sees down front, these results can be expected. Additional time spent on pre-show rehearsals during soundcheck is clearly warranted; the benefits of which can clearly be heard in, for example, “Save My Love” from Wembley two weeks ago, or the version of “Long Time Comin’” from Coventry. With only thirteen shows left on the European leg, there are still plenty of opportunities for Bruce to finish out the tour strongly. It would seem logical that one of the remaining German shows will get “Born to Run” (“USA” having been done in Munich), and the prediction here is that the Limerick, Cork and Belfast shows will each get one of the three albums being done on the tour. That leaves wide open the possibility for some special shows before the end of the month, including, in particular, the arena show in Leeds and the two final nights in Kilkenny. I reviewed this show for Backstreets. Report can be found there. There is no immutable requirement that the final Springsteen show of a multi-night stand be the best of that stand. Yet, by the final night of a stand, one can at least have the reasonable expectation that the setlist will be, at a minimum, changed and varied. Saturday’s show was plain baffling, given that the songs “surrounding” the album performance were almost all repeats from earlier in the stand (“Cadillac Ranch,” “Raise Your Hand” and “Rosalita” were the exceptions). Once one takes into consideration what was played in the two Oslo and two Turku shows, the events in Stockholm become more frustrating. Bruce has ready and at his disposal plenty of alternatives rather than playing “The Rising,” “Sunny Day,” “Out in the Street,” “Twist and Shout,” “Thunder Road,” and “The Promised Land” yet again. Of course, there’s nothing wrong with playing any of those songs (“Sunny Day” excepted). It’s just that they had all already been covered earlier in Stockholm. There’s no need for Bruce to default to these regular crowd-pleasers when he is already essentially performing an encore in the main set. If there was ever a night to skip those songs, this was it! If “Born in the USA” comprises song numbers 7-18 of the set, then Bruce owes it to the audience to try something a bit more challenging in those first seven spaces, or in the ones that follow. I can fully admit that the full-band version of “Real World” with horns and singers that I hear in my head is not likely to be played, and neither is much of the “Tunnel of Love” album. There is still plenty, however, that Bruce reasonably can and should be doing to his setlists to keep them fresh, interesting and relevant. Full-album performances is not one of those things. I remain disappointed that Bruce thinks that performing “album” shows is either the best way to thank his fans, or the best way to do something “new” with his show. As he proved to everyone in Turku, neither of those things are true.